ANKOR was formed in May, 2003, when some fourteen-year-old friends decided to get together to enjoy, create and let their imagination run wild with music. After performing a lot of concerts and publishing several demos in Spain, their first album ‘Al Fin Descansar’ (sung in Spanish), was released by the Spanish label ‘Santo Grial Producciones’, in January 2008. The band received wide acceptation by the public, as well as good reviews by the press specialized in rock music, especially considering that the average age of the members was only 19. Various Japanese distributors acquired the album to distribute it in Japan, where it was sold out within only a few weeks. 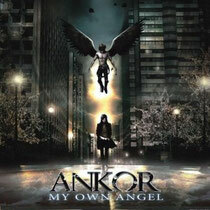 During the last months of 2010, a new CD (now in English), called ‘My Own Angel’, was recorded and produced by Ankor. The video of the first single, ‘Remaining’, was shot in Revolver Studios by the renowned Swedish director Patric Ullaeus (In Flames, Within Temptation, Arch Enemy, Europe, Kamelot, Children of Bodom…) With a much more mature, personal and evolved style, the band has released their new album in October, 2011 and they hope to extend their music all over the world.